It’s been a while since I’ve talked about hypothalamic amenorrhea. Why yes, I did recover from this more than three-and-a-half years ago, but it’s something I won’t soon forget. And I know so many of you found me because I wrote about this issue on the blog and you were searching for answers that were hard to find. Even though I’ve said a lot of what there is to say about recovering, especially in my ebook, I have more to say about life after recovery. When I was a guest on a podcast a couple of weeks ago, I answered the question “how do you protect your fertility” and well, that got me thinking that it’s something I should address on the blog. 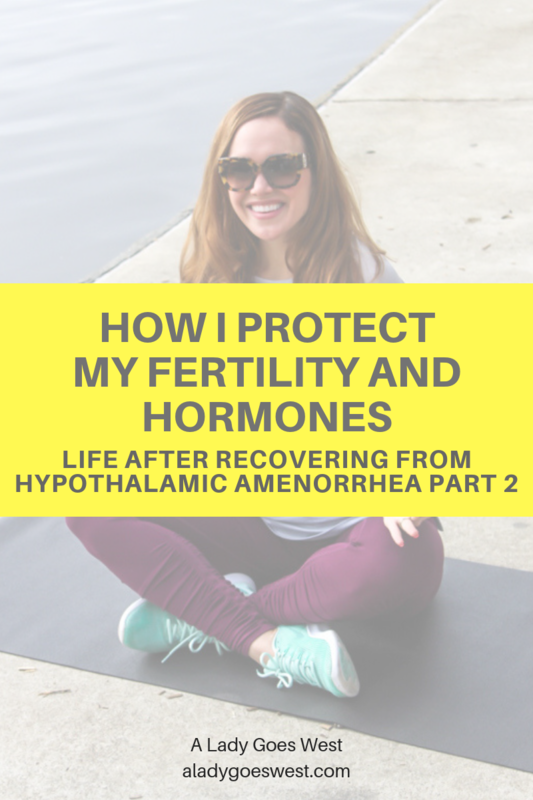 Because even though I healed from hypothalamic amenorrhea (HA), got pregnant, had a baby and am now a mom, I still want my hormones to be functioning properly, because that’s how the body and mind runs smoothly. I don’t ever want to go back to a place where things aren’t right. Avoid hormonal birth control (and be my own advocate). Birth control is a very personal subject. As a woman, in this day and age, we are supposed to feel empowered to take birth control. But quite honestly, this empowerment comes at a price when you choose hormonal birth control with synthetic hormones (which includes most forms of the IUD, except for the copper one, and all pills), and nobody (except a select few in the wellness world) is talking about the harm that these cause. Most women don’t care that they are taking synthetic hormones, simply because they’ve never been told the consequences. And it doesn’t help that doctors prescribe the pill to women of all ages to “fix” a host of problems, like acne and painful periods, to name a couple. But the pill doesn’t fix anything, it covers it up, masking symptoms. You’ve got to be your own advocate if your doctor tells you to take the pill to “fix” something, instead ask them to help you uncover the root cause or ask for a referral. And you will likely only learn the hard way once you come off of the pill, as your symptoms reappear and they are worse. Synthetic hormones perform differently in your body than real hormones as well. If you want to have a healthy body with strong fertility and functioning hormones to feel your best, you’ve got to let your body do it’s thing. This is up to you — and I understand some women feel they need that pill. Then you do you, but know that you will NOT know if you have a regular menstrual cycle if you are on the pill, as the pill forces a fake period using synthetic hormones every month. I think the pill is great for a big portion of the population who needs it — and it was there for me for many years when I needed it too — but I also think that once you are informed and are able to make other choices, you should consider them, certainly once you get within a year or two of wanting to get ready to have children. That’s all I will say on the matter. You do what works for YOU! Avoid endocrine disruptors as much as I can. What the heck is an endocrine disruptor? It’s a toxin, that gets into your body and messes with your endocrine system, known to cause fertility issues, as well as birth defects, cancer and much more. These toxins go under the names of BPA, fragrance, phthalates and others, and they are frequently found as ingredients in common household cleaning products, pesticides, makeup, skincare and other things we use all the time. Somehow, these toxins aren’t regulated, so they are legally included in the products we buy in stores and use unknowingly. When I was healing my hormones, my acupuncturist mentioned this to me, and I started exploring it more and more on my own. I was already cleaning up my diet and reducing packaged goods and choosing organic foods to avoid pesticides and more, and finally, I started finding more natural body and skincare products too. I started using coconut oil as lotion, then I started using almond oil to remove my eye makeup, then I tried to begin looking at labels of everything else. I also swapped out many of my household cleaning supplies (this is a work in progress). I’ve written more about this in this post about reading labels and in this post about switching to Beautycounter too, which is all because I wanted to stay away from as many toxins as I can. You can’t be perfect in this department though, it would drive you crazy. But every little bit helps! Eat a lot of healthy fats, warm foods, complex carbs, fermented foods and the occasional slab of grass-fed beef. If I’m being totally honest, I would say I probably eat a little more now than I need to. Oftentimes, Dave looks at my plate and asks me if I’m going to eat it all. Yes, the answer is yes. I think that when you realize you went through a period where you weren’t fueling your body enough — you sort’ve go a bit overboard once you get to the other side and then maybe over-fuel yourself. My meals are very calorie dense, full of healthy fat, they include lot of whole foods and are also almost always warm. I learned about eating warm foods to support my fertility when I was recovering, and I’ve kept up with that — when you eat too many raw or cold foods (sushi, salad, smoothies), it takes too much energy for your body to heat up and digest the food — thus taking that energy away from your reproductive functions. YES, I definitely have salad once a week or so, but the majority of my meals are warm and cooked. I like it that way, it just feels better for me. I think it’s important to look at your overall diet when you are trying to heal your hormones, keep them healthy or maintain your fertility. Are you mostly eating whole foods? Eggs, vegetables, fruits, hearty grains, grass-fed beef, bone broth, etc.? If you’re existing on protein bars, crappy microwavable meals and processed hot dog meat, you are not doing your body or your fertility any favors. Because I know I have a sensitive hormonal system, I avoid intermittent fasting, I eat before workouts, I snack, I eat nutrient- and calorie-dense food, and I don’t track what I eat at all. I literally have no idea how many calories I eat, but I do know that I’m always quite full after my meals, and I feel really energized and good all day. I know that I could probably cut back a bit on my portions and lean out, but I also know that I lived a life as a very lean gal with lots of visible muscles, and even though that may look good on Instagram, it doesn’t mean anything at all. You know what means a lot? Being so healthy that you feel good in your body all the time with a lot of natural energy and no nagging issues. That’s where I’m at. It’s priceless. Monitor the length of my cycle. We’re past the TMI disclaimer, clearly, but my cycle is very regular. It came back on it’s own about a year after Brady was born, while I was still nursing. I don’t think it’s that common for a cycle to return while nursing, but mine did. From the moment it came back, it has been a perfect 28-29 days every single month. I use an app to keep track of the length, just to make sure. I know that if I start exercising too much, drop my calories or add too much stress, that cycle will lengthen, and I don’t want that. Your cycle tells you a lot. Even though I don’t work 55 hours a week at a busy corporate job any longer with a commute, I do work quite a bit, in addition to being the full-time caretaker of a toddler. It’s a lot. But, I have my boundaries, which I’ve written about in this post about being a work-from-home mom. I don’t work on Friday or Saturday nights, I don’t get up super early to fit in work, and I also get out usually at least once a week for something like a blowout, manicure, solo walk or even a stroll through Nordstrom just because. This alone time is great for me. But so is hanging out with Dave and shutting off from technology. It’s very important to keep your stress levels down when you want to maintain strong fertility and balanced hormones. Whatever you need to do to relax, do it. I’m five days into a meditation practice (more on that soon), and it’s another way to get centered and zen each day. Yoga? Massages? Epsom salt baths? Reading for pleasure? It all works. Limit my HIIT workouts, and limit the duration of my workouts. Exercise is stress on the body. Let’s not forget that. Exercise also does wonders for the body in mind, but only in the right doses. I have certainly learned that different people can handle different amounts and intensities of exercise. Some people do NOT feel good when they are doing HIIT (high intensity interval training) at all, they get headaches, they feel weak, it just doesn’t feel right. Whereas, some people who grew up playing sports can handle hours of incredibly intense workouts each day and keep their hormones totally fine. As I wrote in my ebook, I was able to continue exercising while recovering from hypothalamic amenorrhea, which is against the advice you’d normally hear. However, I cut down on the load significantly. I went from 15 hours of tough workouts a week to 10, down to 5 and ended up healing with about 1 hard workout a week and 3 easier ones, approximately, give or take a few. But here’s the thing, once you truly heal your body, you can slowly start to handle a bit more. I know that for sure, because I’m living proof. Right now, I don’t do any HIIT, per-say, but I do do intense exercise 2-3 times a week, including teaching a 45-minute BODYATTACK cardio class and taking a 1-hour BODYPUMP weights class. I try to keep my workouts at one hour or less, and I have usually 2 days that are lighter and AT LEAST 1 full day off of exercise a week. I know that extreme fatigue feeling that my body gets during tough workouts, and I don’t push to that as often as I used to. Not saying that I don’t work hard, I just know my limits. I think my body can handle just a bit more than I’m doing right now, and it’s taken years to work back up to my current level. I will NEVER do a ton of HIIT, because I know I can’t. I also don’t think my body loves sprinting, nor fasted cardio, so I avoid those mostly — although it would feel good to hop on the treadmill and hit some high speeds, and I’ll do that here and there if I want to — once again, always monitoring my energy levels and cycle to make sure I’m not doing too much. Weights, barre, walking are the safest options for me, but I’ve been fine with adding two BODYATTACK sessions back in a week over the last couple months, whereas I had to entirely cut out BODYATTACK in order to recover my hormones and get pregnant. Over the least three years, I’ve learned more about what it means to be truly healthy than ever before, and it took being unhealthy on the inside to help me see the light and make some changes. However, I want to be very clear and say that I do not have it all figured out, but I do know that I make the decisions that feel right for me and my health and body right now. So there you go! Acupuncture — With Brady duties, I just can’t make it to the one-hour sessions any longer, but I do miss it. 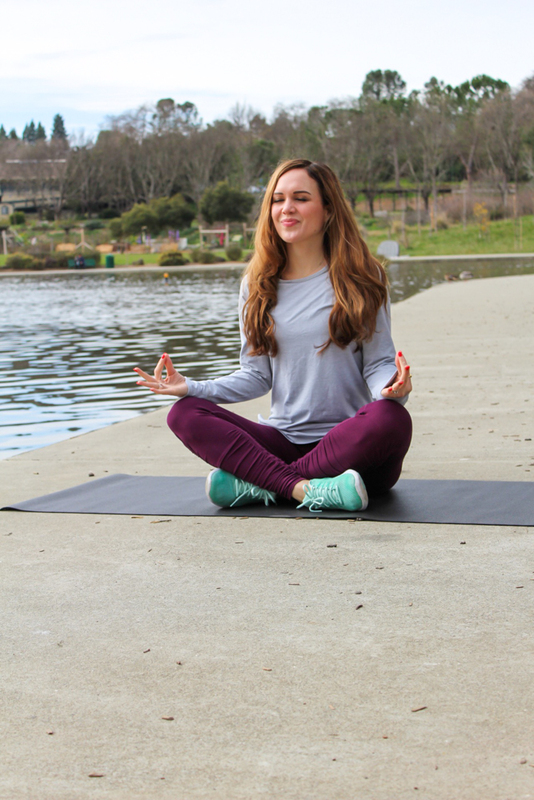 It helps to balance you, reduce stress and more and can be helpful for keeping your body running smoothly every day. Read more about what acupuncture did for me and what you should know before you go here. Acupuncture was a huge part of my recovery and path to pregnancy. Yoga — I miss yoga! Once again, with the way my schedule is now with teaching and with Brady, I just haven’t been able to make it a priority. I do love the way yoga makes my body feel, and I’d love to get back into it one day soon. Yoga was a go-to workout for me during recovery and pregnancy too. That about does it! Let me know if you have any questions, my friends. I’m here for you! 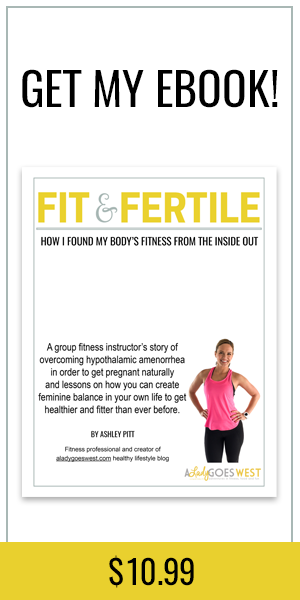 And of course, you can get the full story on my path to discovery, recovery and pregnancy in my ebook, “Fit and Fertile.” Use the code BLOGFRIEND for a little discount at checkout. What’s something you do to protect your hormones? What’s one healthy thing you plan to do this week? Hi! Could you direct me to some of the research surrounding cold vs warm foods to support fertility? I am an RD and have never heard this before. Thank you! I just had my first baby 7 weeks ago via IVF due to looooong time hypothalamic amenorrhea which had healed but left lasting effects on my reproductive system. I have decided I will not being going on birth control and I will be continuing with my diet and exercise changes as well as going back to acupuncture in order to get my period back and hopefully conceive #2 naturally!!! Allison!! SOOOOOO congrats on your first baby, that is amazing! You are only seven weeks in, so I hope you are still eating warming foods, relaxing as much as possible and accepting as much help as you can. I’m sorry to hear you are still seeing effects from HA, but I bet if you stay the course with healthy lifestyle choices you can prove those docs wrong and conceive on your own! 🙂 You are amazing! What’s interesting is I feel like pregnancy and nursing REGULATED my hormones for me. I got my cycle at 14, it was extremely intermittent for the next 10 years. There were 2 times when I did not have a cycle at all for 18 months, many occasions where I’d go 3-6 months, and only probably two total years of having a regular monthly cycle. I had HA for 5 years Pedro getting pregnant I only had to recovery cycles…. I’m currently in my 8th month of breastfeeding… did you breastfeed? When did you get your cycle back after baby? Sorry if this is too personal of question to ask! TgNks for all the great info! I think moms need lots of good calories for sure! There’s no time off! These are all excellent strategies for maintaining fertility. I began my recovery journey from HA two years ago and it was the hardest thing I’ve ever done. I’m currently 5 weeks post partum and have previously thought about how I will maintain my fertility moving forward. I don’t ever plan to use the pill again and will go back to tracking my cycles and fertility signs in order to keep myself healthy. I’m also making sure to eat well in terms of making sure I’m eating enough overall as well as enough fat and carbs. I’m probably eating more than I need to but since I’m breastfeeding currently I don’t want to chance under fueling. I’m also MUCH better at managing stress than I used to be in terms of maintaining boundaries, saying no, and asking for help. Like you stated, I worked hard to get my body healthy and there is no way I’m going back! I think most women don’t realize the stress exercise is to the body. They think they feel great with tough workouts and it relieves stress, but in reality, that’s the high cortisol giving them that “high.” Thanks for addressing exercise as a stress. Also this whole Intermittent Fasting fad, is going to be leading many women down a path to HA, sadly 🙁. What I have been doing to keep my hormones healthy, (and my bones, joints, etc). Cutting down my workouts to less than 1 hour, cut out running for a few days of strength training and 1-2 easy swims per week. I like running (not that I am great at it) and run about 1 half marathon a year. I have discovered over the last few years of training, that I only like running about 2 days a week. So many training plans have you running 4 or 5 days, but I do better with more cross training. I haven’t lost any speed, gained muscle mass, and I feel like my recovery is better too. For me, it’s just about finding my balance. I just run for fun, so it’s important for it to stay fun! Curious what TCM herbs you took before falling pregnant? I’ve recently started acupuncture and have been loving it so far! My acupuncturist has suggested a few herbs so wondered what success other had had with them. Hi Amber! My acupuncturist made some combined herb mixtures for me that I don’t have the name of off-hand, but I also took two over the counter herbs regularly, I took Chaste tree berry here a couple times a day: https://amzn.to/2FIbfI9 and royal jelly too: https://amzn.to/2WDU2qp So glad you are loving acupuncture! This is super helpful! I love the encouragement from you Ashley, because even though I’m learning to protect my cycle and hormones more, I still get sucked in sometimes by exercise culture I see, and I want to get back into 1+ hours per day of intense workouts, but my body can’t do it. Also YAY for all the warm cooked foods. In general, those are better for me too! Hi Emily! It’s SOO hard not to buy into what you see on Instagram or all around — but we never know if people who LOOK FIT really are healthy. We only know how we are treating our own bodies, and we’ve got to treat them how they want to be treated. I know you are working hard at that — you are doing amazing! Sending you lots of love! Hi! I totally agree to avoid hormonal birth controls, I have never tried it and I’m actually frightened to use it. Do you have any recommendations on natural birth controls? Is it more healthy for women? Any advice from you will be appreciated. Thanks! Hi Cora! It’s such a sensitive time still — I would say continue with all your recovery efforts and rest a lot, eat a lot of warm food and hope for the best that it will return! Sending you lots of love and know that staying hormonally healthy will be an ongoing process, but a worthy one!